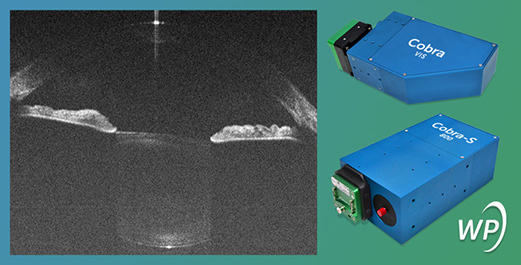 Durham NC – Wasatch Photonics has expanded its flagship Cobra OCT spectrometer product line to include new models for 550 nm vis-OCT and long-range 800 nm OCT imaging, further extending the capabilities and application domains of OCT imaging. These two new variants of SD-OCT imaging access structural and functional information in wavelength ranges only accessible through cost-effective SD-OCT technology, and can deliver high resolution images at line scan rates up to 250 kHz. The new Cobra VIS models operate at visible wavelengths, leveraging the differential absorption of oxy- and deoxy-hemoglobin at 500-600 nm to provide depth-resolved, localized oxygenation mapping concurrently with the acquired OCT image. This addition of functional information to the existing structural image can be used to improve understanding and diagnosis of pathology, with applications in high resolution retinal imaging, 3D microscopy, and angiography. Specific benefits of Wasatch Photonics’ Cobra VIS spectrometers for vis-OCT include imaging at up to 1.9 mm depths, and up to twice the resolution of 800 nm OCT imaging. Proprietary optics correct for chromatic aberration and reduce roll-off to as little as 6 dB at 1.2 mm imaging depth. The newly developed long-range imaging Cobra-S 800 OCT spectrometer uses a patent-pending optical design to provide up to 12 mm imaging range at 800 nm. This allows long-range imaging of the full anterior chamber and other curved surfaces to be accomplished in a single shot using 800 nm OCT. While 1300 nm is traditionally used for OCT imaging at depths beyond 4-5 mm, this new Cobra-S model extends the reach of 800 nm OCT to depths of >1 cm at half the cost, with no loss in image resolution. Wasatch Photonics’ new Cobra OCT spectrometer models for 550 nm vis-OCT and long-range 800 nm OCT imaging open up two new operating regimes for OCT – blood oxygenation mapping and greater depths at lower cost – while delivering the same low roll-off, high resolution, high speed images for which the Cobra-S series is known. They are available as both off-the-shelf and custom OEM spectrometer modules for applications in research and industry. Founded in 2002, Wasatch Photonics designs, manufactures and markets high-performance optical coherence tomography (OCT) products, spectrometers and systems for Raman, fluorescence, and UV/VIS/NIR spectroscopy, and volume phase holographic (VPH) gratings for pulse compression, astronomy, spectral imaging, and OCT. Their high-performance VPH gratings, spectrometers, and systems are used in a diverse set of industries, including those in the defense and security, chemical manufacturing, pharmaceutical, medical, energy, education, computer, and electronics markets. Wasatch Photonics’ optical coherence tomography (OCT) solutions range from spectrometers and probes for research and OEM use to full plug and play systems for ophthalmology, dermatology, angiography, and nondestructive testing. For more information on Wasatch Photonics or any of their products, visit the website.